The date was May 2, 2003 when Will Daskal of New York City caught this incredible and amazing largemouth bass from a lake in the Harriman State Park's Seven Lakes chain, near Sloatsburg, NY. 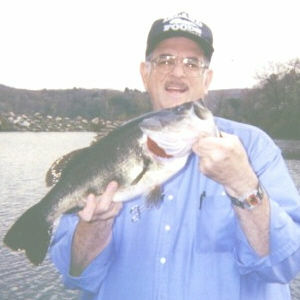 The big bass was caught on a Jimmy Houston Excalibur Super Spook, surface plug. After a few quick photos the fish was released. Will Daskal owns and operates a fly-fishing school for trout in New York's Catskills region. Catch and release only! That is the golden rule at his place of business, Although he owns and operates a fly-fishing school for trout, his personal form of fishing relaxation is fishing for pickerel, northern pike, and largemouth bass. 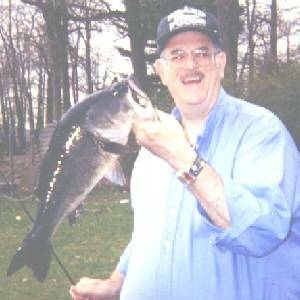 He has been bass fishing for more than fifty years. The two primary species of bass inhabiting N.Y. State waters are smallmouth and largemouth bass. Both species may be found in most all of the states lakes and rivers. The average bass caught is between 1 and 5 pounds, but there are many fish taken every year over 5 pounds. Bass fisherman by majority are a catch and release group so that affords this species a bit more protection than they would other wise receive. The state wide size limit on bass is 12 inches in length and a daily creel limit of 5. Open season on bass is the 3rd Saturday in June through November 30th.